All prices are in Canadian dollars. We use the total number purchased (ELM331P + ELM331SM) for the calculation. The ELM331 is a complete temperature measurement and control system in an 8 pin package. This integrated circuit is designed to compare two resistances and drive an output pin depending on the relative value of each. 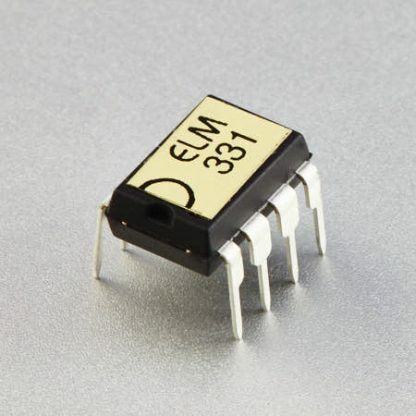 Typically, one of the resistors will be an NTC thermistor, and the other one will be a temperature independent resistor (whether fixed or variable). When the magnitude of the resistance connected to pin 2 exceeds the value of the resistance connected to pin 3, the output pin will be driven to a high state. Hysteresis maintains the output in that state until the relative values differ by approximately 8% (or typically 2°C for a 10KΩ thermistor). To reduce the possibility of sporadic outputs, a condition must exist for three successive cycles, or 6 seconds, before the output pin can change state.